I write this sitting at the neighbourhood park watching my son play. He loves the park. Everyday, the first thing out of his mouth is whether I can take him to the park. I don’t mind the park since I grew up across from Regent’s Park in central London. Regent’s Park was our second home and I believe there was a method behind my father’s madness. He was away from home on business many days and I am quite certain, he deliberately purchased our flat across from the park. This is what kept my mother’s insanity intact. She had four children under the age of seven when we first moved to London, insanity indeed. We spent hours at the park feeding the vicious ducks. That description may surprise you as you may have expected something more effusive about the pretty, Mallard ducks and the cloud white swans, but quite honestly, those ducks were horrid and I stand by my original description, vicious. Looking back, I believe we only went to feed the ducks because my mum felt too guilty throwing the bread ends away. I know it wasn’t because those ducks were precious! Regardless of the ducks, the park was gorgeous. Spring and summer in the park were unforgettable; The Rose Garden, the fields of tulips and daffodils, the 99 ice cream cone, strawberries and cream by the tennis courts, to name a few things I enjoyed. My friend and I used to enjoy sitting on the banks of the lake under the massive weeping willows. In the fall I loved raking through the fallen leaves to find conkers. It was such a thrill to find one and I would get so excited. If we were lucky to get snow in the winter, off we went to make snow men and snow angels. Regent’s Park was also where I played many games of netball and field hockey for my school. I had many favourite spots in the park but one I remember most fondly is the Inner Circle (if I remember correctly) where in the spring, the cherry blossoms burst forth in all their snowy, blossomy glory. Colorado reminds me a lot of England in many ways and this is probably why I love it here so much. It’s like being home..almost. The parks are abundant here and with mostly temperate climate year round, it’s a great way to spend your time outside. It definitely entertains and exhausts little six year old boys. However, the past few days have been searing and I have had no inclination to set foot outside. Today is not too bad in the shade. There’s a nice breeze blowing and I am not sweating profusely! That’s always a good feeling. Quiche is an ubiquitous British summer dish. Any kind of filling dribbled into a buttery crust, topped with some wobbly custard, a bit of cheese and then into the oven till the filling is bubbling and the top is golden. I ate many a quiche in London and they were all good. This must be why I like quiches and tarts, sweet and savoury ones. Also, tarts are renowned in French cookery and I am besotted with French pastry. 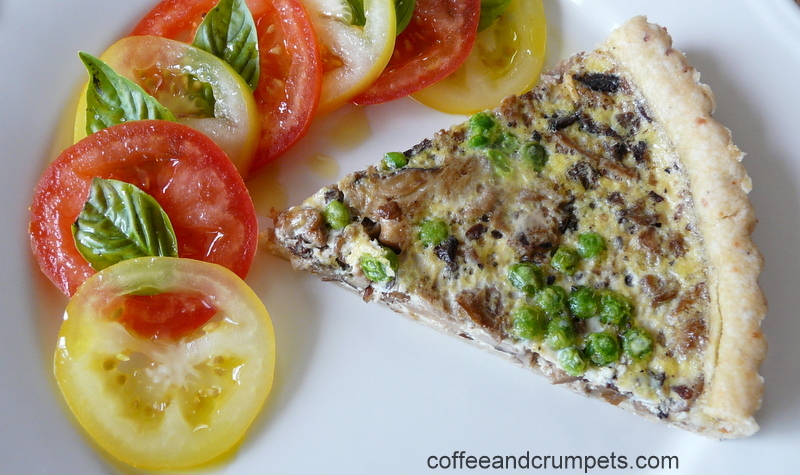 Therefore, I make quiches and tarts quite often for everyday dinners and many times when I entertain. Tarts are great on a buffet table. They look impressive and they are gosh darned tasty. The exotic mushrooms I picked up from the farmers market over last weekend were sauteed with some fresh thyme and garlic and tossed into an all butter, Herbes de Provence crust. A light custard whipped up with some eggs and milk held the mushrooms in place while they baked. I did not add any cheese because the mushrooms are so delicate I wanted their flavour to shine in this Mushroom Tart. I have done a post on Exotic Mushroom Saute and this uses that recipe. You will find the crust recipe in a separate post. Since there are step by step pictures, I figured I would give the crust its own post. 4-6 servings, depending on hunger. NOTE: you can use wild mushrooms or even plain white mushrooms. If you choose to use the white mushrooms, I would add some caramelised onions and some cheese, like a good Swiss or a sharp cheddar. This will add some amazing depth of flavour to the humble white mushroom. Preheat the oven to 350 deg F and place a baking sheet in oven to heat. Roll out the chilled pastry crust into a 13” inch circle. 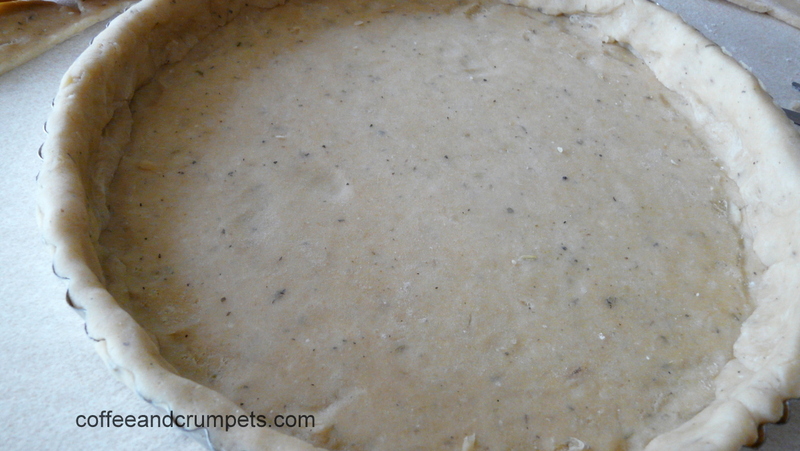 Slowly roll the crust onto the rolling pin and transfer to the tart tin. Unroll the pastry over the tin and press down into the tin gently. by rolling the excess back unto itself to reinforce the edge. At this point, chill the crust for 20 minutes. I usually make the crust earlier and have it chilling in the fridge or in the freezer. Meanwhile, whisk together the eggs and milk or half and half. Take out the crust from the fridge and fill with the cooled mushroom mixture. 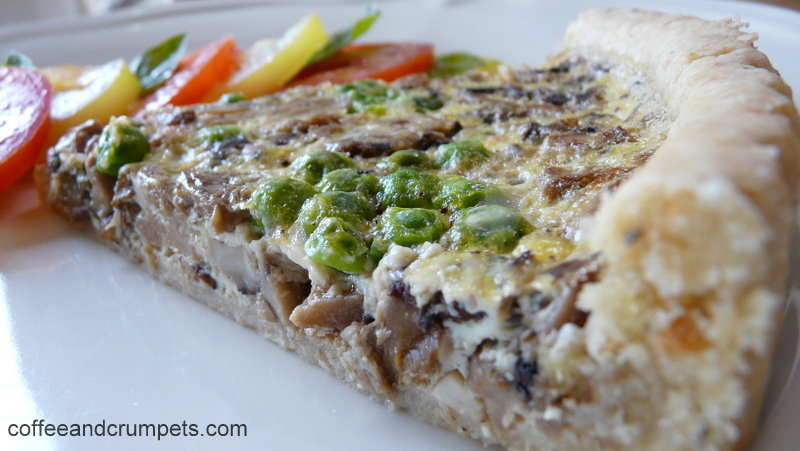 Even out the mushrooms in the crust and sprinkle the peas all over. Pour over the egg-milk mixture, covering the mushrooms evenly. Place the filled tart tin carefully onto the baking sheet in the oven. Let the tart cool so it can set and not break when cut, 15 minutes or so. Slowly place the tart tin on an inverted bowl and let the sides drop down. Can slide a thin metal spatula between the tart bottom and crust and remove the bottom of the tin. Place the tart onto a cake plate. Slice the tart into 6 pieces. Serve as an appetiser or lunch main/entree with a salad. Do you like quiches and tarts? I have also noticed, that even though the saying goes “real men don’t eat quiche,” its a load of codswallop. Men love quiches and tarts. I know my husband enjoys them and he’s a man’s man. 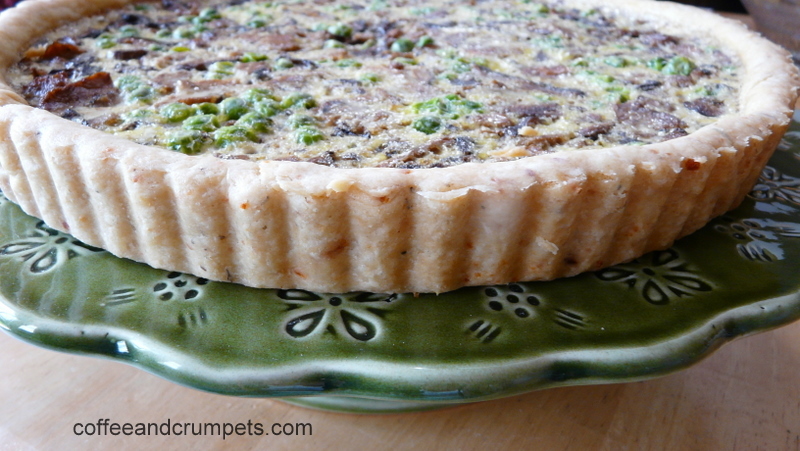 I am sure that the posts to come will contain many variations of tarts and quiches because I love them. Tell me your favourite versions. Thank you for reading and a Happy Monday! « Hot Days, Cool Nights and Stunning Sunsets.